I found the pattern/directions on the Purl Bee blog. It was super easy for this novice. The tote is great for the beach, farmers market, or just to and from work. 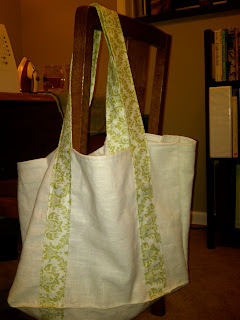 I used a natural color linen mix for the body and a cotton quilting fabric in a green vintage pattern for the straps. This bag would make a great gift for any lady in your life. Very cool! I love the look of the blog. Jen- Thanks been trying to work on it!